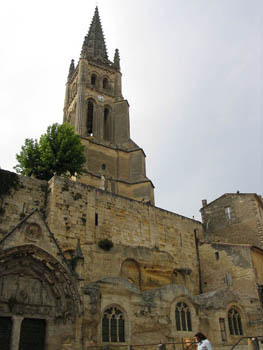 St Emilion, famous for the wine produced in the area to which it has given its name, is also a village in the Gironde department, about 30 kilometres east of Bordeaux. The village was originally founded in the 8th century, when a monk by the name of Emilian came to the site, living in a hermitage dug out of solid rock. Other monks followed him, each digging their own habitation from the rock; eventually a monastery, and then the village followed. The tradition of constructing buildings from caves continued - the village today has two churches, one of which was entirely hollowed out of the soft chalk in the 11th and 12th centuries. It was badly treated during the French Revolution when it was used as a saltpetre factory, but there are still some traces of the original wall-paintings. The village has been made a World Heritage site because of the unique character and homogeneity of its architecture; as well as the "monolithic" church, there is another, conventional but very fine; the old monastery; a moat; a convent; and a marvellous town square.